'The Damned' #1 Review – AiPT! 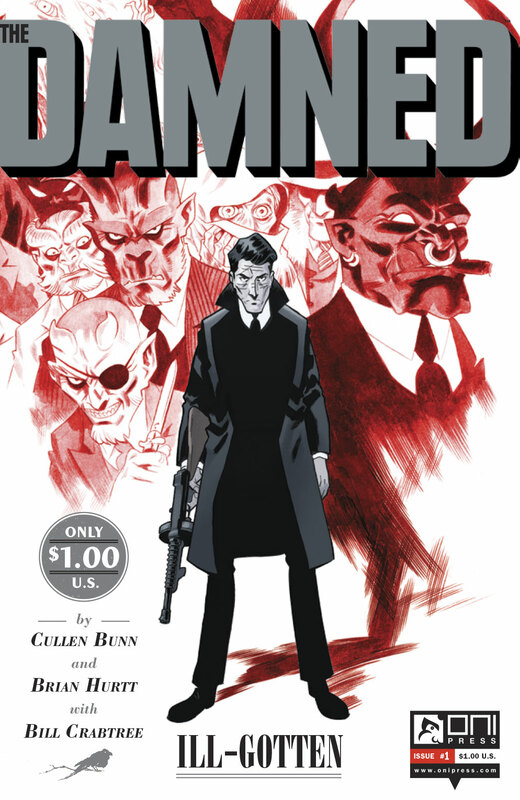 Oni Press has revived writer Cullen Bunn and artist Brian Hurtt’s demonic noir series The Damned for a new ongoing run that begins this month. As someone who has never read the previous two mini-series, The Damned #1 provides a good introduction to a unique world where demons and gangsters live together. The new issue kicks off “Ill-Gotten,” in which the cursed Eddie’s past disrupts his normal life –well, as “normal” as your life can be when you can’t really die. In a Prohibition-era world where demonic princes pull the strings that make crime families dance, Eddie is a mortal with two things working for him. First of all, he can’t die. Well, he can and does, quite often, but he doesn’t stay down for long. Second, Eddie runs the Gehenna Room, a nightclub with a strict “no demons allowed” policy. But blessings and curses don’t look all that different these days, and failing to tell the two apart can get a guy killed-over and over again in Eddie’s case. So when one of Eddie’s old pals shows up seeking sanctuary, Eddie knows he’s in for a double-cross, and that means walking the line between salvation and damnation once more. The world of The Damned is like a cross between the Warner Bros. gangster pictures and Guillermoo Del Toro’s movies. Eddie can die, but if someone touches his dead body, they die instead and he reawakens like nothing happened. In fact, the story kicks off with Eddie’s throat already slashed as he desperately searches for a new person to touch to save his life. When Eddie’s not dying, he’s running the Gehenna Room nightclub, where he doesn’t let demons in. He thinks his life is all set, until Pauly Bones comes back into his life and people–including some with horns–are looking for him. While the original Damned mini-series was black and white (and later published in color), “Ill-Gotten” is a mix. Most scenes are monochromatic, with just the blood colored between various shares of grey. Scenes in the nightclub have color, as if adding to Eddie’s delusion that he’s better than the underworld he travels in. The point is clear, but The Damned‘s colorless pages look much better. The dialogue is really enjoyable. Bunn has clearly spent too much time watching Edward G. Robinson and James Cagney movies. He also introduces elements of this world as Eddie meets them, leaving few mysteries for us to think about while waiting for #2. Hurtt’s stylized work is also a great match to the story. It’s not too detailed and borders on cartoony, embracing the unrealistic DNA of the story without rejecting its grit. Bunn and Hurtt, who also work together on Oni’s The Sixth Gun, bring back The Damned in a way that should please new fans and interest old ones. After all, there are few things cooler than a gangster with demon horns. Light on exposition for a first issue, jumping right into the action. Color sequences cut in on the great atmosphere of the B&W pages.